The wizards at Magpul have done it again. This time with the humble rifle bipod. From its earliest start of two crossed sticks, to the dedicated but standalone bipods of the 19th century buffalo hunters, to the advent of the bolt-on bipods of bolt actions and machine guns in the 20th century, bipods have proved their necessity. 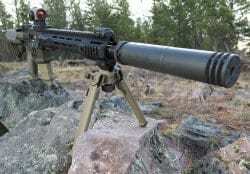 One of the most popular civilian bipods is the ubiquitous Harris. The spring-loaded adjustable length legs of the 12.3 ounce Harris have pinched skin and caused blood blisters for over six decades. And still it remains popular. Until now, that is because the industry disruptor extraordinaire named Magpul Industries just showed up to the party and heads are turning. 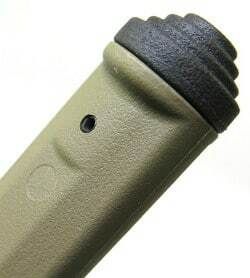 By mixing their special alchemy of hardened steel, anodized aluminum and proprietary plastic polymer, Magpul has delivered yet again another product that not only outperforms all others in its class, but makes everyone need one even if they didn’t yet know it. So what is the Magpul Bipod? Well, let’s start with what the Magpul Bipod isn’t. It isn’t two pounds. It isn’t $300. It’s isn’t spring-loaded. And won’t give you a blood blister or cut your finger no matter how many times it’s deploy it. And just what is the Magpul Bipod? Well, it is now the finest 11.7 ounce, $109, button-deployed bipod on the market. Available in two colors and three attachment options, the Magpul Bipod has raised the dusty old bipod bar so high that unless there is another company out there like Magpul, we won’t be seeing a better bipod offering any time soon. And we all know Magpul is a singularity. The Magpul Bipod, for such a simple and elegant design, has a remarkable portfolio. In addition to being a six-position, adjustable length, pan, tilt, 45-degree, reversible platform of stability, it keeps its footprint small and personality sedated. Personally, I opted for the Picatinny rail option for the widest application across my rifles. The dual-bolt clamp grabs the rail, securely tightened with either a larger slotted screwdriver or 1/8th inch hex wrench. The key to the Magpul Bipod’s performance is its ability to lock up solid when under load. The geometric magic of the triangle is in the amazing property where a triad of corners connecting three lines eliminate movement and distributes the force equally across the entire geometric structure. So no matter how much play there is in the system when not under load, when forward pressure is added to the equation, the Magpul Bipod steps up and locks down. The Magpul Bipod has no loyalty to any particular triangle whether acute, obtuse, scalene, isosceles or even equilateral. The variability of the triangles along with the added 50 degrees of pan and 40 degrees of total tilt makes the Magpul Bipod a wildly effective stability enhancement. The polymer and 6061 T-6 anodized aluminum legs extend four inches beyond their initial 6.3 inches. The pair of glove-friendly buttons, one each for leg deployment and leg extension, snap to attention through spring-detent only. Not a blood blister in sight. For those who don’t get the reference, the Harris bipod is known to retract with sudden force often catching a bit of skin in the mix. Don’t worry, it happens to everyone, and like having a mean dog for a pet, you learn to keep your distance. The legs of the Magpul Bipod have agressive rubber feet, but if your mission requires something even more overt, the legs will accept Atlas-pattern bipod feet whether spikes, skids, or spiky skids. 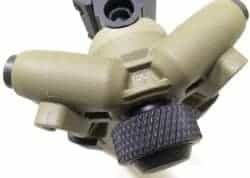 A single roll pin holds the current shoes in place so swapping them out is as easy as swapping out a flat trigger guard with a Magpul enhanced trigger guard on an AR15. Easier actually. When combining the tilt of the Magpul Bipod with a single full leg extension, you can get over 45 degrees of single direction offset. The average roof, pretending for the moment that you have SHTF overwatch in your neighborhood, is 26.6 degrees. Any roof over 37 degrees is considered a steep slope. In fact, a roof slope of 45 degrees would be difficult to stay on without ropes. 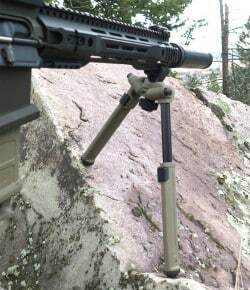 So the Magpul Bipod will easily perform as needed across all useful domestic ridge lines. And should your immediate needs not require any panning (side to side swing of the rifle), you can spin a disk that sits between the bipod and mounting platform to lock out the panning feature. 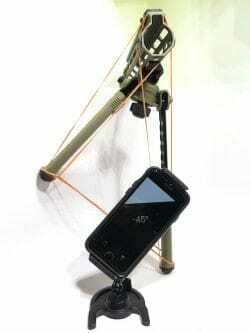 This adds a measure of additional stability to situations where you are guaranteed a perpendicular intersection between bipod face and target direction. 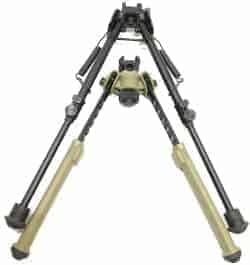 Before the Magpul Bipod, my favorite bipod was the Elite Iron Revolution Bipod. It is truly a feat of engineering, and has no loyalty to pretty much anything. It works just as well upside down as right-side up essentially allowing the rifle barrel to spin freely but solidly within the bipod’s center. The two problems with the Elite Iron Revolution Bipod compared to the Magpul Bipod are that the affordable steel version Elite Iron starts at $600, and second, the 34 ounces of bipod is three times the weight of the Magpul Bipod. All that said, the Elite Iron works well for those heavy rifles in the upper thirty caliber numbers and well into the forty-plus calibers. In the crotch of the Magpul Bipod is a manly one-and-a-quarter inch diameter knob that locks or loosens the pan and tilt. A quarter turn is plenty to access those features, but if you want to reverse the direction of the Magpul Bipod legs, you will need to spin the manly knob about four revolutions. And why would you want to reverse the leg direction? Simple. 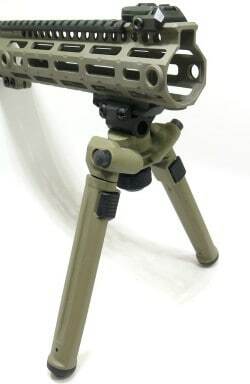 First, the bipod legs are usually mounted at the most forward position of the available rail, and since bipod stability is often a function of the forward pressure load on the bipod (lightly pushing the rifle away from you to strengthen the angle of the bipod), you would want the deployed bipod legs to be pushing against their housing rather than against the release mechanism. But this usually puts the feet of the stowed bipod in front of the muzzle essentially extending the overall length of the rifle package. By spinning the bipod around pointing the feet towards the stock, the Magpul Bipod extends only a quarter-inch in front of the mounting point. 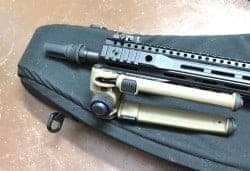 I have several covert rifle cases that easily hold my ARs but not with the bipod pointing forward. 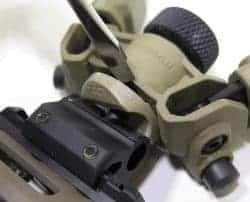 A quick spin of the center knob (which, by the way, does not fully unscrew so there is no risk of loss or rifle wardrobe malfunction) the Magpul Bipod spins freely allow the rifle system to smoothly seat into its minimum case. The knurled knob at the center of this angular masterpiece is a massive improvement over previous bipod designs. But also of note are other two pairs of buttons controlling the legs. A 7/16th inch diameter metal button releases the legs to re-stow them. Both legs can be deployed their 90 degree rotation without any button pressing. 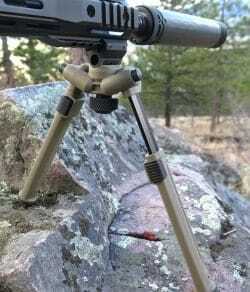 Because there is no button-press needed to put the Magpul Bipod to work, it’s possible to drag the bipod feet on the ground or other object while bringing the rifle barrel upward. This causes the legs to snap into position and remain there until the release button is pushed. Actually the two-position Harris leg is not quite true. There is a set screw with a knob that holds the leg in place with a turn. However, the leg is still spring loaded with only the set screw holding it still so the briefest turn of the set screw knob sends the snapping violently home. Further, it requires two hands, one to hold the leg in position against the spring tension, and the other hand to turn the set screw. And pretty much the same mess happens with the overly aggressive springs driving initial leg deployment and retraction. Watch your fingers. So Magpul has done it once again with the Magpul Bipod. By combining its engineering talents and in-house materials science, Magpul has created a rail accessory you can be proud of, and will actually improve your rifle’s performance along with your own. So do yourself and your rifle a favor; BYOD: Bipod Your Offense and Defense.